In the last two blog posts, I have discussed a powerful rationale for developing your visualization skills beyond the common theory that it “just improves performance.” Yes, it improves performance, but visualization is a whole lot more than a sports psychologist’s trick. Visualization is a core skill in your entire approach to harnessing the full power of your mind. That’s because, when we learn to visualize we are also learning to communicate effectively with a large part of our mind system. That is the part where memories are stored, intuitional information is conveyed and our hearts speak to us. It is not located in the region of our brain that does our rational thinking. The language it uses is not words, but imagery and sensations. Thus my premise is that learning the language of visualization will allow us to tap into that region of our brains and minds—which are different by the way—much more effectively and to use it for achieving our goals and becoming our ideal selves. It is estimated that this part of our mind represents the lion’s share of our mental power. I am all about using more of my mind…how about you? In one of my past blogs, I promised a simple visualization practice that can get you on the road to developing what I call the “Mind Gym.” The Mind Gym is your interior training space where you will go to do your internal visualization work. You attend a CrossFit gym or Yoga studio to train physically, so why not have an internal Mind Gym to go train in mentally? It is a powerful tool for developing visual language skills. We spend a lot of time working with the Mind Gym in the Unbeatable Mind program – so if you are interested in this topic and are not a member yet, I highly encourage you to join us! (click here for a special offer). Another great way to get started is with the drill below that I developed. 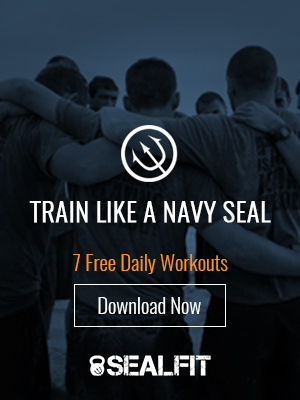 It is one of the new Mental WODs we offer in the SEALFIT Online training program. The visualization is very simple and will quickly allow you to clear your mind of clutter so you can focus better. It will also begin to develop your visual language skills. I created it years ago as I struggled to clear my mind while sitting in Zen meditation at Seido Karate in NYC. This simple visualization finally did the trick. Enjoy and send me your feedback. Hooyah! Purpose: Quickly clear your mind and enter a calm, meditative state. WOD: Practice the Wiper Visualization once a day when you feel ungrounded or need to focus your mind for an important project. Process: Close your eyes and imagine that your busy mind is like rain falling on a windshield. That windshield is your deeper self, your witnessing self. Now imagine a windshield wiper intermittently wiping away the thoughts of your mind. Each time the wiper sweeps across your mental screen, it leaves a clear windshield reflecting a calm and clear mind. Anytime you experience a new thought, wipe it away with the envisioned wiper and notice the calming effect of your mind settling down into a meditative state. Do this for a minimum of five minutes. If it helps, try counting your breaths (inhale and exhale equals 1 rep) to also help keep your mind focused while practicing this visualization exercise.